The first R1 and R2 coins were issued when South Africa became a republic and introduced the rand as its national currency in 1961, after the referendum of November 1960 which established autonomy from the British Empire. The R1 and R2 were gold bullions coins that replaced the half-pound and pound gold coins introduced in 1952. Both the pound and the rand gold coins matched the specifications of the British half-sovereign and sovereign, including the gold alloy (crown gold) with a fineness of 22 karat (91.67%). The gold rand coins were minted until 1983, while they were gradually replaced by the Krugerrand, starting in 1967. 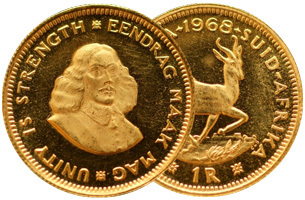 The obverse side of the original R1 and R2 coins bears the forward-facing portrait of the Dutch founder of Cape Town, Jan van Riebeeck, while the reverse design features the famous Springbok illustration designed by Coert Steynberg for the 5-shilling coin introduced in 1948. Both coins were reintroduced in 1997 as a commemorative coin series. Each series has a different theme and their design changes every year. Today R1 coins are minted as 1/10 ounce 24 karat (99.99 %) gold coins. The first theme of the R1 gold coin commemorated the First Heart Transplant. In 1998 the Cultural Series was introduced, portraying all the major cultures in South Africa. The first R1 gold coins out of this series depict the San Culture (also known as The Lost Generation, Beautiful People or Bushmen). The obverse side shows the South African Coat of Arms and different South African cultures on reverse side. Other editions of the Cultural Series include commemorations of the Zulu People, the Tswana People and the Afrikaaner People. From 2008 until 2010, the R1 gold coins were also part of the FIFA World Cup Series. In 2011, the South African Pollinators Series was introduced, commemorating the African Honey Bee in 2011 and the African Monarch Butterfly (Danaus Chrysippus) in 2012. 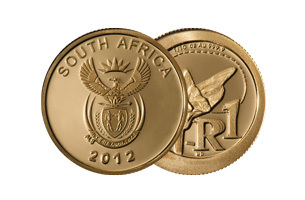 The R2 coin was reissued as a 1/4 ounce 24 karat (99.99 %) gold bullion coin. 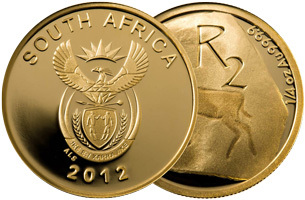 The first R2 gold coin edition started as the Paleontological Series portraying paleontological motives of South Africa. In 2002 the World Heritage Sites Series was introduced depicting the World Heritage Sites of South Africa. In 2007, a coin design competition was conducted to stimulate public interest in South African coins, using the R2 gold coin series to represent the initiative. 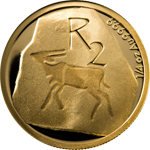 The winning design of the 2007 competition portrayed the Vredefort Dome on the 2008 R2 gold coins. Another coin design competition took place in 2008, with the winning design depicting the Richtersfeld Cultural and Botanical Landscape. R2 gold coins were issued in commemoration of the 2010 FIFA World Cup in South Africa from 2006 to 2010. In 2011, the Cultural Heritage Series was introduced, commemorating the Khoisan Heritage in 2011 and the Khoisan Culture – Eland Stone Carving in 2012. Each of the R1 and R2 coins has a Certificate of Authenticity that describes the coin’s specifications, year, limited edition and contains a short description of the product. Both coins are legal tender in South Africa. They are issued each year in limited editions of 2000. The R1 and R2 coins minted from 1961 to 1983 contain 91.67% gold (22 karat) and 8.33% copper. While the original R1 and R2 coins from 1961 – 1983 have great historical value, the new editions from 1997 to today have the finest purity and feature extraordinarily beautiful designs. Even though the value of gold may fluctuate in the face of market dynamics, gold coins like the South African R1 and R2 will be in demand. Own this coin? Get a free appraisal! Simply enter your information below or call us toll-free at 1-888-812-9892 to receive your free appraisal. Learn how precious metals can strengthen your portfolio, protect your assets and leverage inflation. *The information contained on sbcgold.com has been prepared by Scottsdale Bullion & Coin for informational purposes only. It is not intended to provide, and should not be relied upon for; investment, legal, accounting or tax advice. Please consult with a professional who may specialize in these areas regarding the applicability of this information to your individual situation. The trademarks and registered trademarks are property of their respective owners. Copyright © 2019 Scottsdale Bullion & Coin. All rights reserved.